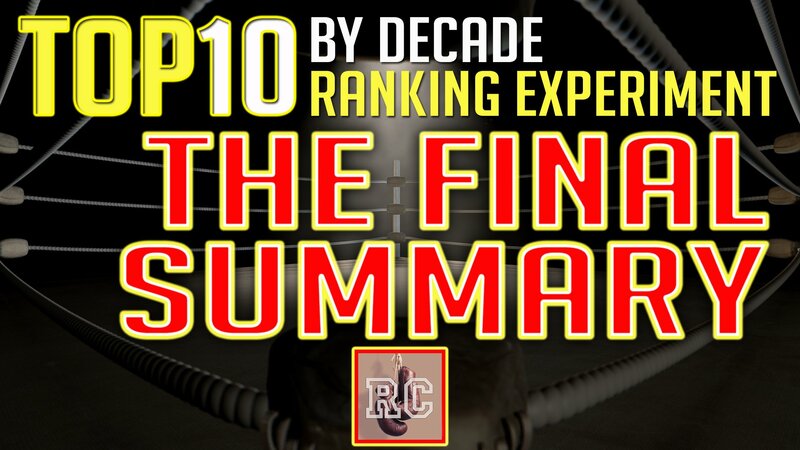 This is the final installment in the “Top 10 by Decade Ranking Experiment”, where we have utilized Ring Magazine’s rich archive of historical rankings in order to try and objectively determine the top 10 boxers from each weight class in each decade. The experiment started with the heavyweight division, and we worked our way south through all of the weight classes until we reached junior flyweight. That was followed by the Grand Finale Top 100 countdown where we combined all of the points every boxer has ever received according to the scoring system which is based on Ring Magazine’s rankings, which began all the way back in 1924. Here in “The Final Summary” of the ranking experiment, we will apply the scoring criteria throughout all of the decades (including the partial decade in the 1920s and the partial data from the current decade). In doing this, we are attempting to objectively determine the top 10 boxers from the 1920s, the 1930s, the 1940s, and so on and so forth, all the way through the current decade where we have data up until the conclusion of 2017. So nothing is finalized yet on the current decade, as we still yet have 2 years to go before the list takes final form. It will still provide a snapshot of what’s been going on in the boxing landscape in recent years, with regards to how highly boxers were regarded in this era by Ring. In addition to the decade lists that will be covered here in The Final Summary, we will also compile data for all seventeen weight classes, utilizing all of the data for all of the divisions Ring did ratings for. For the original eight weight classes – heavyweight, light heavyweight, middleweight, welterweight, lightweight, featherweight, bantamweight and flyweight – we have data for every single year between 1924 and 2017. For the newer weight classes, that lack the rich history of the original eight, our datasets are far more inconsistent, with many large gaps where we are lacking data. But despite this shortcoming, we make use of all of the available data we do have, for better or worse. This will conclude the Top 10 by Decade Ranking Experiment (although the results will sometimes be used as a launch pad for other topics in future episodes of Rummy’s Corner). To view the final lists from this experiment, which started back in March, please watch and enjoy The Final Summary of the Top 10 by Decade Ranking Experiment.